Prior to Santa arriving in Tecumseh, the children are treated to a free hot dog, chips and soda meal sponsored by the Tecumseh Chamber of Commerce. While the children waiting for Santa, they can enjoy a free horse-drawn wagon ride. 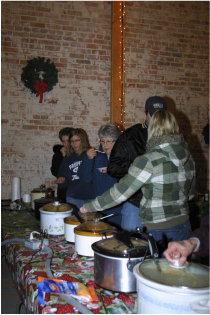 In combination with the Avenue of Trees display is the annual Chili Cook-off sponsored by the Tecumseh Historic Square Committee. This popular event is held in the Community Building from 4:30 -7:00 p.m. Area Chili/Soup connoisseurs bring their best pot of chili/soup to be judged and enjoyed by all who attend. Prizes will be awarded for the top three places at 7:00 p.m. The Chamber of Commerce also serves complementary chili and vegetable beef soup to all attendees from 4:30 to 7:00 p.m. There will also be musical entertainment from 5:00-6:30 p.m. to be enjoyed by all and vendors at the Community Building from 3:00 - 7:00 p.m. will have plenty of wares to peruse while you enjoy the Christmas atmosphere. The Johnson County Museum will be open on Sunday, Dec. 4th from 4:00-8:00 p.m.
Click here to see all the activities for the day on the Square and in the Community Building. Sponsors of these events include Tecumseh Chamber of Commerce, Tecumseh Area Arts Council, Tecumseh Economic Development Committee, Johnson County Nebraska Historical Society (JCNHS), and Prairie Sky Clydesdales.